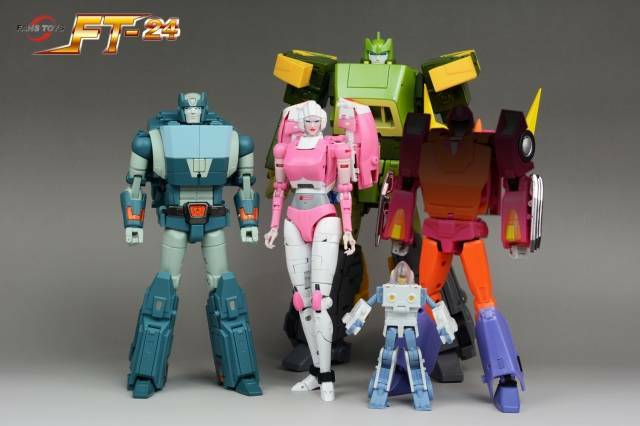 Fans Toys FT-24 Rouge stands 19CM/7.5" tall in robot mode and contains die-cast parts. 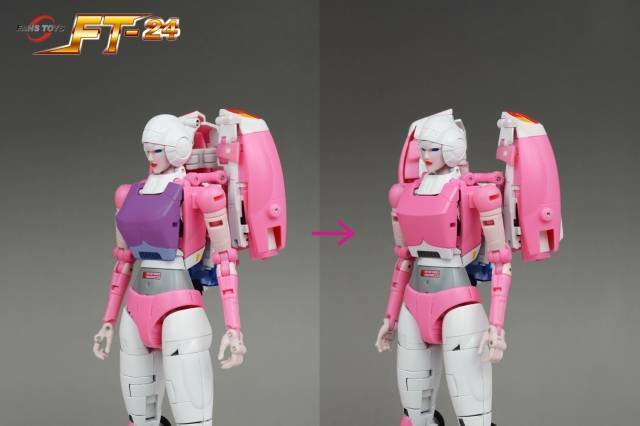 Rouge transforms from robot to futuristic sports car and back and is Masterpiece Scaled! 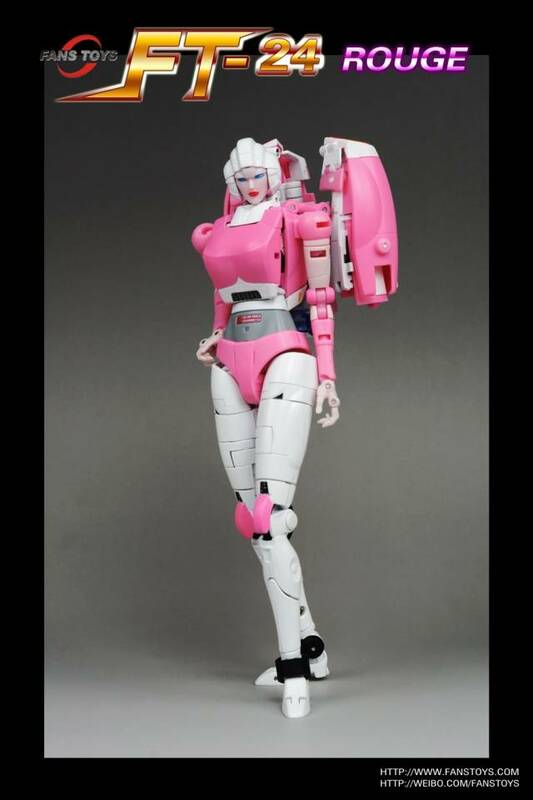 "The best Arcee we'll get"
Best G1 accurate Arcee ever made however there are some flaws. The waste does not turn at all just kinda bends side to side,when moving head the entire chest assembly pops down easy,alot lighter then typical Fans Toys die cast figures. But thats good in a way last thing there is a open gap on the side of the chest that looks off. But the faces are awesome as usual but the small feet make the figure hard to stand still so i wonder why they didnt include a base? Still worth it just not a 5 stars i feel. 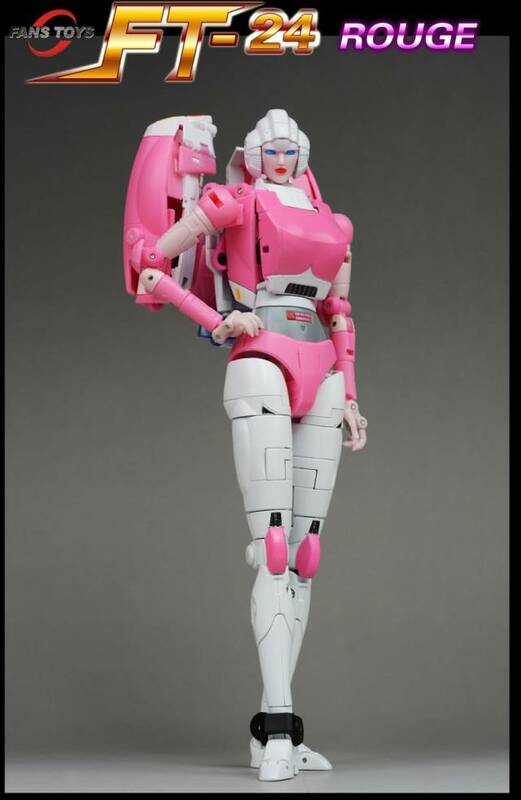 "Worth it, fun transformation, but some issues"
This is a great figure that I found fun to transform, and it makes a fantastic G1 Arcee. As mentioned in other reviews, I wish it didn't have the gap in the torso, and a stand would have been nice since this figure is hard to balance. My biggest issues are the tolerances for the painted parts, such as where the rear portion pegs together and have too much paint to easily connect, and actually require some wear to improve the connections. The other issue I had was swapping out the chest, where the screws did not want to thread back into the chest piece, almost causing me to strip the screws to get the piece securely fastened; I don't think they threaded the holes deep enough, and small threads are fickle. But, the car mode is nicely compact and feels solid, and the bot form looks great. So, if you are on the fence about this figure, just get it because it's well worth it. 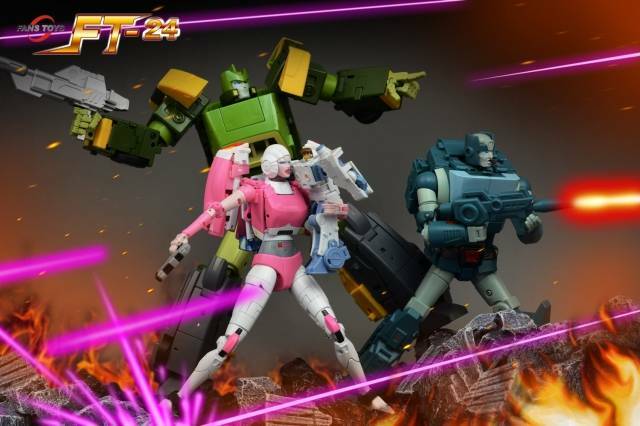 "FT has done it again"
FT's rendition of Arcee is a true masterpiece. I have all the FT dinobots and none were a disappointment. 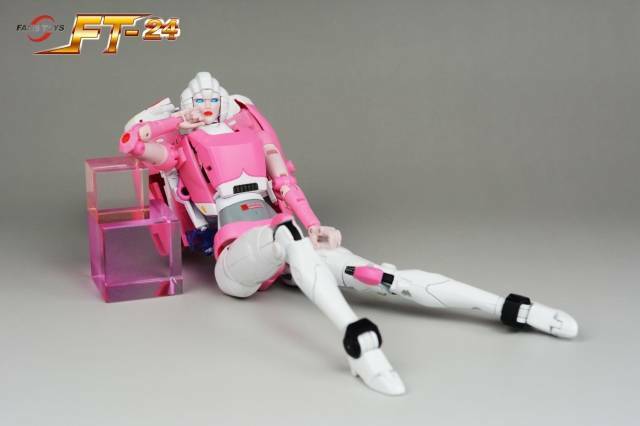 Arcee is no exception. 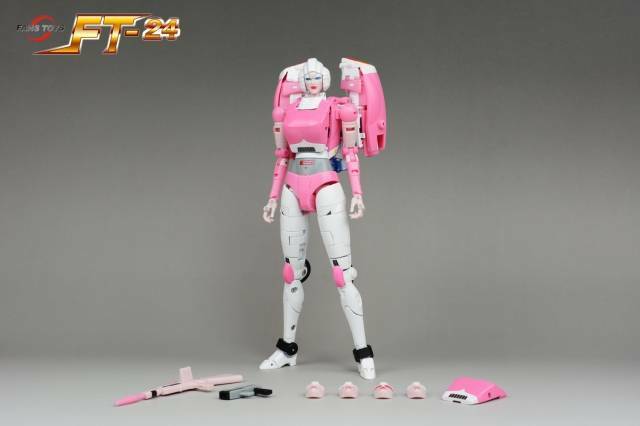 Beautifully crated parts, from her mostly cast metal legs to her metal chest plates (2 variants to choose from), including her interchangeable face options. This, like any of FT's other lines, is worth it. 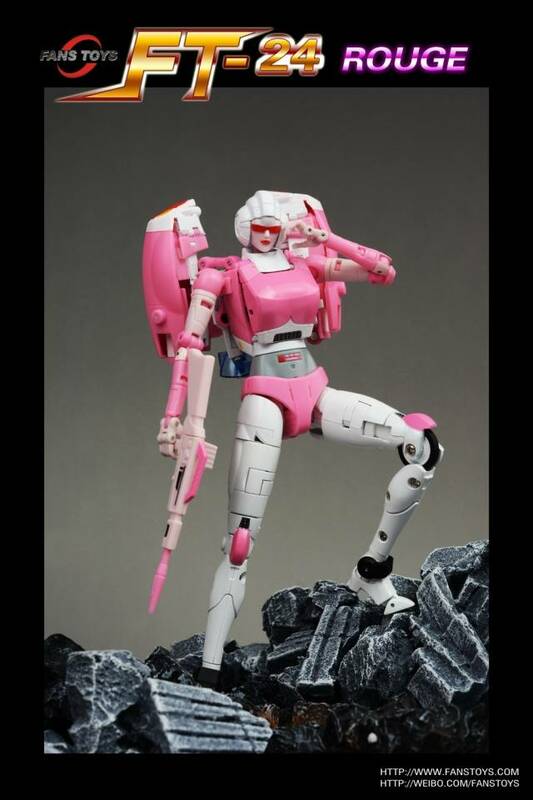 FansToys rendition of Arcee is the greatest one we have seen so far, she looks just like her G1 self. This figure was worth every penny and more! My mom said that. lol. I showed it to her. I have not transformed her yet. she is really complicated and i wanted a good time when i can pay attention. She looks and feels good. I wish the head would not unpeg so easily. I was looking forward to Rouge, since the other 3rd party Arcees looked awful in vehicle mode. Rouge looks good in robot mode, and poseability is great. The feet are kinda lacking though. Her accessories are nice, but I would’ve liked another pistol. The biggest problem I have with her is the transformation. I was frustrated with the instructions and it took me a long time to get her in vehicle mode. The torso was especially difficult. This is a glaring problem because I am an expert, I own a hefty pile of 3rd party Masterpiece scale figures (including Unique Toys Sworder/Sandstorm) and usually have little trouble figuring them out. I’ll get better, but the torso was just too tricky and not enjoyable. However, the vehicle mode looks clean, no thighs sticking out of the back! Huge plus! Glad Fans Toys had enough sense to do that properly. Also, the other problem, the backpack kibble really should be tabbed in, they just hangloose. Not attractive. Excited about completing my movie crew soon. 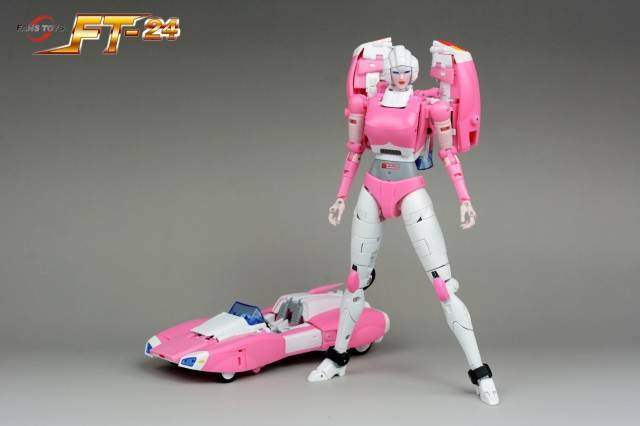 How someone managed to figure out how a fembot turns into a car is beyond me! 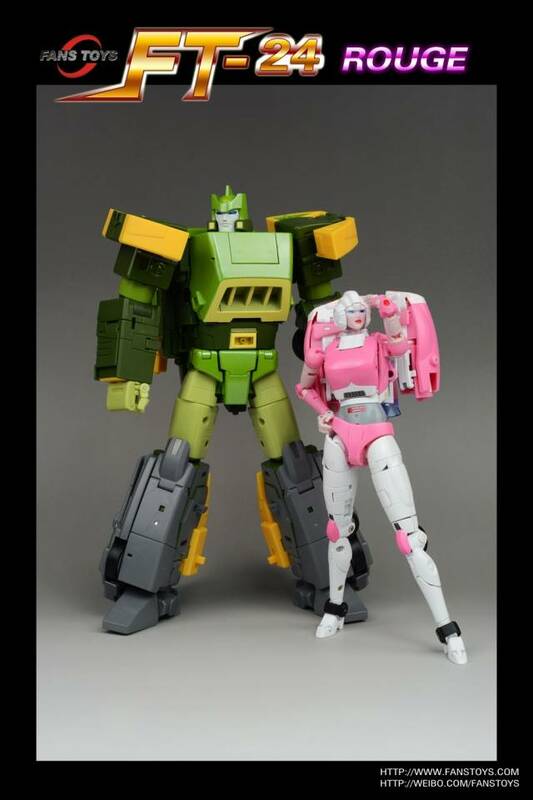 I've seen a lot of things floating around about this figure and, yes. It can be complicated at first. The first two attempts at transforming were not the best, but the more you do it the more skilled you become at it. The complications of transforming an entire car into a slender robot that she's supposed to be is absolutely astonishing. This is a mechanical marvel to me! Once you get her either in alt mode or keep her in robot mode or back into it, you'll find that she is quite lovely to look at. There are no better representations of this figure on the market, all the others, including official, have been pale in comparison to how this one looks. This is primarily due to the fact that unless you want a complex transformation, then you have to have parts that look weird or out of place, or even parts form, in order to get the look that you desire. Sacrifices have to be made in order to pull off the authenticity that you're trying to achieve. There are some problems. Like the way the bar moves to either transform into alt mode or back to robot mode. There are tight spaces there. She has some difficulty standing because of her feet. The weight will pull her one way or the other and you have to find just the right spot in the pose you want her in. It's either that or you buy a stand. She comes packaged with her more rounded chest plate. I prefer the more cartoon one so I switched it. It was a little tight to get some of the screws in and it does involve taking apart that piece and attaching it. I felt like I wasn't sure what I was doing. The cartoon chest plate does not tab in correctly like it's supposed to. Don't force it because you'll just end up scratching the paint. If I had any complaint about this figure, it's the paint application that seems to be failing here. I wish the knee caps would of moved to accommodate for the wheel behind them, but that's a minor thing. I had difficulties figuring out why in alt-mode, there was a gap between the hood and the rest of the car. There are two tabs in between there that you have to, I think, either plug in or get passed in some way. Otherwise, there's a noticeable gap, which somehow becomes less of a gap if you do it in a particular way. A lot of people will complain about a no waist swivel. I think it's fine, there is a waist rocker, which allows you side to side motion. As I said, sacrifices. The arms are dainty and some people don't like those. It's mostly fine, the hands a little tricky. I felt like I might break the tab but I didn't. Though the tab seems to be so long that it will puncture one of the gun slots. Ultimately I will say this. It's an awesome figure and If you want a screen accurate figure, get this. You won't find any other better-looking one than this one right here! You may not like how it transforms or the complexities involved with it, but when you look at it on the shelf you'll be like "yup, that is perfect!" At least, that's how I felt! I love the look of this figure, you definitely need the instructions to transform, I've been stuck quite a few times and had to leave it sit until I could find the instructions again. The accessories are just ok, the guns are "Meh". But the hands and the face are excelent. Still. a pink rifle... no use for it. I'd like to find other weapons that fit her hands.